» Nomachine NX – Desktop Sharing & Shadowing now available. Nomachine NX – Desktop Sharing & Shadowing now available. Wow.. a great week it has been in the enterprise Linux world. You can checkout all the directives from the Admin guide at this link. The desktop sharing and session shadowing functionalities are enabled in the default configuration of the server. Desktop sharing allows the sharing of any of the native displays on the node, while session shadowing allows the sharing of any of the NX sessions running on the node. By default, it is up to the owner of the native display or of the master session to accept/deny the user’s request to attach to the display/session. Now, here’s the $20,000 question – how the hell do we mirror a session or grab a console? I have both the Windows Client AND the Linux client and nowhere is there any option to shadow a session or grab a console. If I try and login to an existing session, it logs off the original user and logs in the one trying to login.. so wtf? I have read the docs – oh, I had to google for the page that lists all the docs, so here they are. Additionally, I personally think the US $750 for the Small Business Server is a little too high as an entry point – or at least expand the free server beyond 2 licenses.. Even a 5 user (+ pay-per-incident support) for $300 would likely make NX a more palatable option for young startups or those wanting to offer a SAAS setup. At the moment, I am just keen to find out how to test the mirroring or grabbing a console… anyone?? I restarted the nxserver daemon just in case, which will disconnect your NX session if you are connected already. BUT – the problem I had is that my remote screen resolution is 1440×900 and my local screen resolution is 1280×1024 – so when I try and connect to my local console, NX fits the width in the 1280px by squashing up the 1440 remote image, which presents a barely readable screen – and it makes the height 900px leaving a gap (which is no big deal). It also seemed much slower than a regular nx session. I will keep playing around but I will probably stick with my current: pkill <program> setup. I read your comments about NoMachine NX and would like to provide some feedback. You might like to visit our website since you wrote this – we have recently made some adjustments to our website and the location of documentation is now much easier. Just go to http://www.nomachine.com/documents.php. There you will find all the installation guides and other useful information. 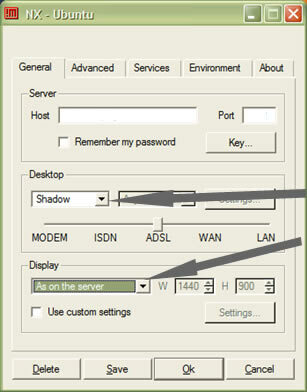 The Administrator’s Guide also explains how to set up session shadowing, as does this article http://www.nomachine.com/ar/view.php?ar_id=AR11B00098. This should solve the issues you have with desktop sharing and session shadowing. Concerning the issues you had with your remote screen resolution, the image is scaled when the local screen does not have the capability of containing the entire remote screen, due to the difference of resolution. The scaling is not applied with NX agent running in ‘viewport’ mode. The viewport can be activated by Ctrl-Alt-L keystroke, and can be navigated by dragging the pointer with Ctrl-Alt kept pressed. The developers are aware that improvements could be made to allow for the varying screen resolutions to be handled better by the end user. Further changes are under evaluation in order to provide the ability of changing the default behaviour and other run-time settings through a graphical interface. User feedback is vital to us, so feel free to contact us directly. The NoMachine Team will take care of sending you a prompt reply. Hi Sarah – No doubt, I appreciate all the effort the NoMachine team has gone to.. NX is truly fantastic – I use it approx 4hrs of every day across a WAN. I often find myself surfing the web through NX (across a 1mb link) – I’d love to get some customers using it and with these newly added features, I think it’s a real possibility. You really need to get the client as a standard in Thin Clients.. at the moment only a few support it. DevonIT & Igel come to mind. I have been able to overcome the “squashing effect” when the resolution of your remote screen is different to that of your local screen but when accessing a local desktop, screen updates do not seem to work correctly, ie: click on a menu and nothing happens until you hover over where you think the menu would be, then each part of the menu starts to appear – and then when you click elsewhere, the menu pixels are still displayed even though the menu on the local screen is now closed.